Please spend a couple of minutes to watch the following video, and remember why the Vulcan should return to the sky. Father and Son, Robert and Steven Lowe, from Newark on Trent, have conceived a brilliant way of raising funds to help keep the Vulcan, XH558 flying. The father and Son team, who will be accompanied by crew chief Taff Stone, have set themselves the target of visiting all 15 exisiting Vulcan airframes in and around the country within a 24 hour period. They would be starting at East Fortune at 00.01 with XM597. They will be joined on different legs by surprise guests and staged events to encourage them on their way. Fellow club members will be acting as coordinators at each location, liaising with the museums involved, creating a presence on the day to welcome the team, as they stop by to change drivers, snap a picture and carry on with their challenge. Supporters will help explain the event and our plight to all the visitors, backed up with promotional posters and leaflets explaining the Pledge fund and the many ways people can help save the aircraft. With 850+ miles to cover, 18 hour 50 minutes journey time, it only leaves 15 minutes spare at each location – and that does not allow for traffic. The time remaining, progress details and pledges or donations received, will be updated for all to see, together with links to partake in sponsoring of the event. On the day, a central control room at Bruntingthorpe, “Scramble HQ” will track the team and give updated details as they progress along the route. Staff there will process Pledges collected en-route and enter onto the on-line system. You will be able to watch the progress of this event, add additional sponsorship or pledges and see the results as they happen. Official collecting tins and any donations received on the day will be added to the running total. At all times, speed limits will be observed. 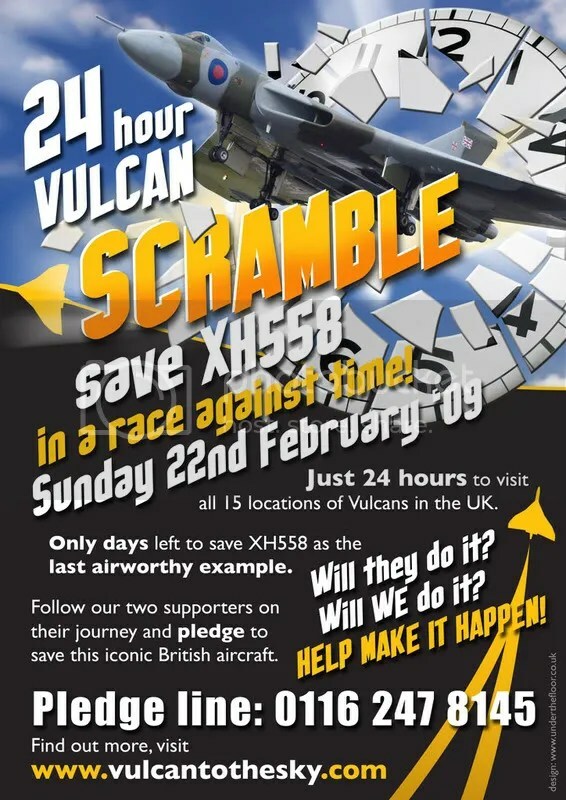 It is the challenge and raising of public interest in XH558 that most appeals to the team. By the early hours of Monday 23rd February, the club aim to have not only raised a significant level of interest, but a not too insignificant level of further funding! But why should the public help keep this plane flying? XH558 is the only airworthy Vulcan in the world. Restored to flight after nearly 15 years at a cost of £7million. She now faces grounding forever, unless an additional £750,000 can be raised in February enabling funds for another full air show season. Last year, she appeared in front of over 1.5 million people. She inspires immense pride in all who see her. A full education programme is built around her, not only telling the story of the cold war era, but the value of science and technology in inspiring future engineers. She was the “mother of concorde” – Can you help us save this iconic British Aircraft? Who are Teasin Tina and Lusty Lindy? If you read my blogs, you should realise that these ladies must be planes. Indeed, I am not one to dissapoint. However, these are not just any planes. 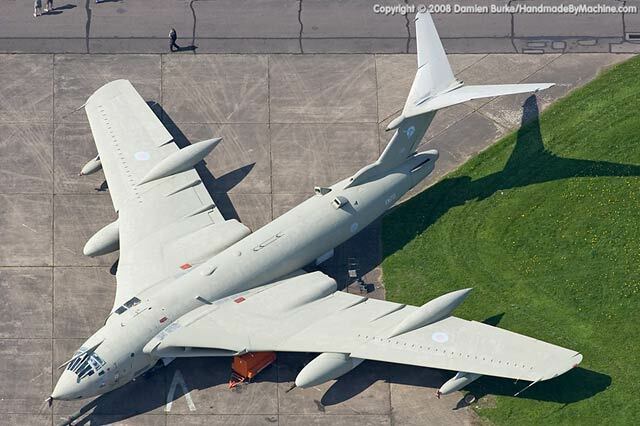 These are the last two working Handley Page Victor K.Mk 2’s. Many people write these lovely planes off as relics from the Falkland’s War. Planes that served a purpose at the time and were retired. These planes actually continued service up until 1991, and were even active in the first Gulf War. XM715 ‘Teasin Tina’ and XL231 ‘Lusty Lindy’ are now the only two Victors in teh United Kingdom that are still in working order. Many people work hard to ensure these two beautiful planes are kept in good condition. Furthermore, they are maintained to such a level that they are able to undertake fast taxi runs. Who knows, in the future we could see one flying again. Now when I look around for old footage of the Vulcan or Concorde there’s always some good pickings. However, once in a while, I come across something that really made me sit down and almost cry. The following video on youtube by user ViddyKJB is so amazing. The whole thing is topped off with some wonderful patriotic music. Watch out for the skybolt version of the Vulcan. Another thing to remember as you watch the aircrews running into those Vulcan’s is that, only the pilot and co-pilot were assured of ejecting. The crew in the back horseshoe seats, had no ejection facility. They only had the option to drop out via the access hatch below. This option was even more dangerous if for some reason the landing gear was still down. Risks of leaving the aircraft this way included hitting the landing gear struts, hitting the underside of the aircraft and risking being burnt via the engines. Even with all these dangers, the crews readily fullfilled their duties, protecting the UK from the former USSR and nuclear war.